Coronal Mass Ejections (CMEs) are often viewed as the major drivers of space weather disturbances in the Sun-Earth system. Shocks driven by CMEs can excite radio emissions characterised by a slow frequency drift across dynamic spectra. These radio emissions are known as Type II solar radio bursts and can consist of two bands with a frequency ratio of 1:2. Each of these bands can split into two thinner sub-bands, a phenomenon known as “band splitting”. The cause of band splitting has been under debate for several decades. The two most widely-accepted interpretations are the Smerd et al. (1974, 1975) model and the Holman & Pesses (1983) model, but make opposing predictions for the true location of the emission sources of the split-band Type II components. The Smerd et al. (1974, 1975) model attributes the band splitting to emission occurring from the upstream (undisturbed) and downstream (shocked) regions of a shock front, two virtually co-spatial locations. The frequency split observed is thus explained by the steep density jump between the upstream and the downstream sides of the shock front. The Holman & Pesses (1983) model, on the other hand, explains band splitting as emission originating from two spatially separated parts of the upstream region of the shock front. 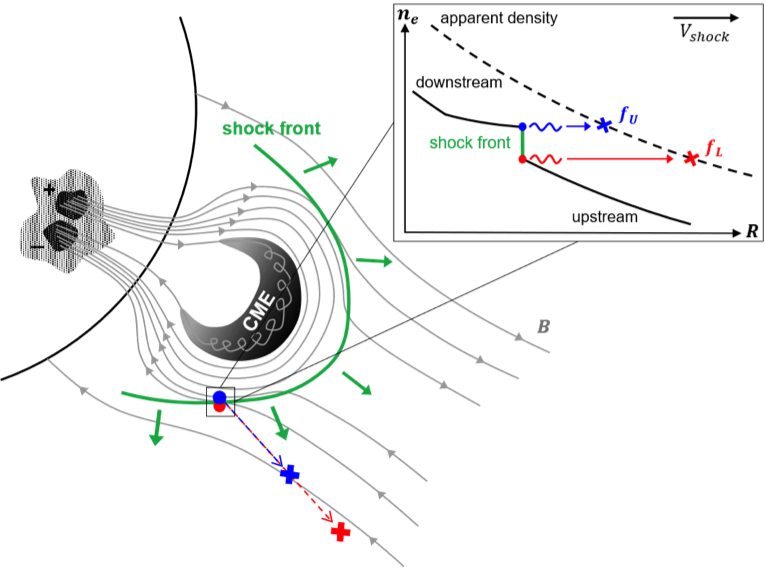 In this case, the frequency split is the expected result of the different densities that the two sources encounter due to their separated positions along the curved shock as the shock propagates through the gradually and radially decreasing coronal density. Intriguingly, Smerd et al. (1974, 1975) were aware of previously-observed large separations between sub-band sources (approximately 0.06 – 0.25 Rsun) challenging their model which requires the sub-band sources to originate from virtually the same region. They provided several reasons as to why these observed separations might not be representative of the true physical relation of the sub-band sources. Suggestions included the time delay due to the inability to image the two sub-bands at the same time, meaning that a source propagated with the shock during that time, and the frequency-dependent shift that sources could experience due to radio-wave scattering effects in the corona. Hence, the dominant mechanism of band splitting is a topic of ongoing discussion in solar physics. We utilised the imaging capabilities of the LOw-Frequency ARray (LOFAR) to study the spatial relation of the higher- and lower-frequency sub-band sources. LOFAR has the unprecedented capability to image the emissions at any and all frequency and time points. We have thus obtained, for the first time, simultaneous images of the two sub-bands enabling us to estimate the locations of the sources without any time-delay ambiguities. 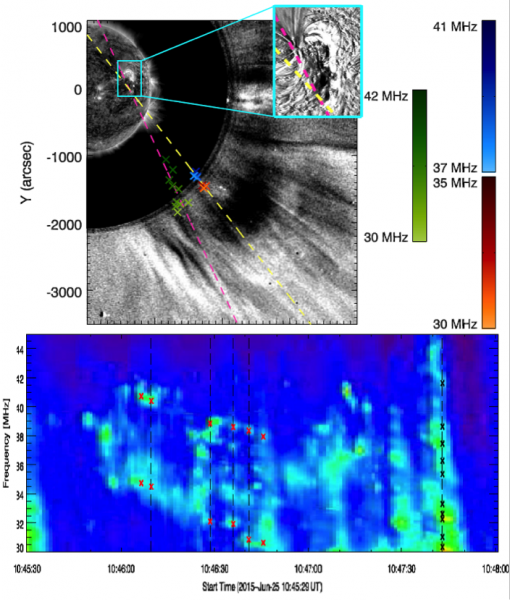 A split-band Type II burst was observed by LOFAR between 30 and 40 MHz (see Figure 1). The separation between the sources of the two sub-bands was estimated to be approximately 0.2+/-0.05 Rsun. The locations of both sub-band sources were compared to the Newkirk (1961) coronal density model and it was found that both sub-bands are described by the 4.5xNewkirk model. The description of both sub-bands by the same density model is inconsistent with the Smerd et al. (1974, 1975) model as a density jump between the sub-band sources is not observed. In light of recent investigations (Kontar et al. (2017)) that highlighted the dominance of scattering effects on low-frequency observations, we quantitatively estimated, for the first time, the extent of scattering on split-band Type II bursts. Scattering shifts sources radially father from the Sun, with lower frequencies experiencing a higher degree of shift. We find that a 32 MHz source appears as radially shifted by ~0.3 Rsun from a 40 MHz source. Therefore, the imaged separation of 0.2+/-0.05 Rsun is consistent with radio-wave scattering effects, indicating that the sub-band sources could in reality be virtually co-spatial. Since scattered sources are observed radially farther from their true locations, the deduced coronal density will appear to be larger than its true value. We find that coronal densities are exaggerated by a factor of ~4.3, meaning that the 4.5xNewkirk model obtained from the observations is an over-estimation. We also find that once scattering effects are considered, the sub-band sources are no longer described by the same density model, but a density jump between the sub-bands occurs. These effects are schematically illustrated in Figure 2. We showed that the large separations observed between the components of a split-band Type II burst are consistent with radio-wave scattering effects, highlighting the importance of considering radio-wave propagation effects in the analysis of radio emissions. As a consequence, the true emission sources of a split-band Type II burst could originate in virtually co-spatial regions, and hence the emission could be produced in the upstream and the downstream shock front parts.